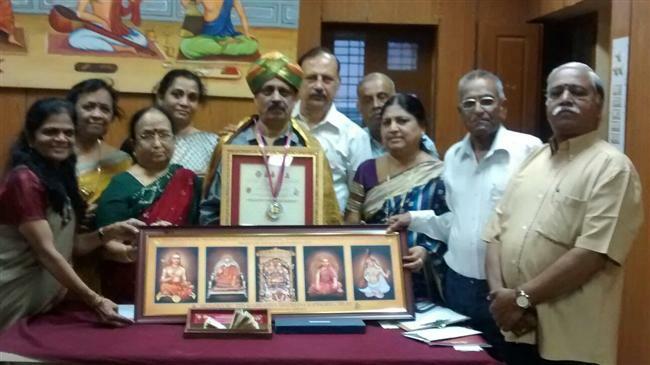 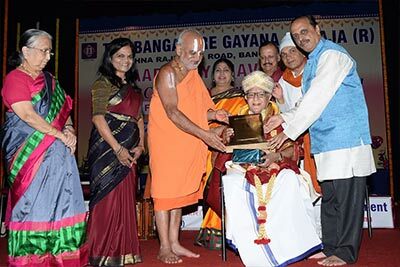 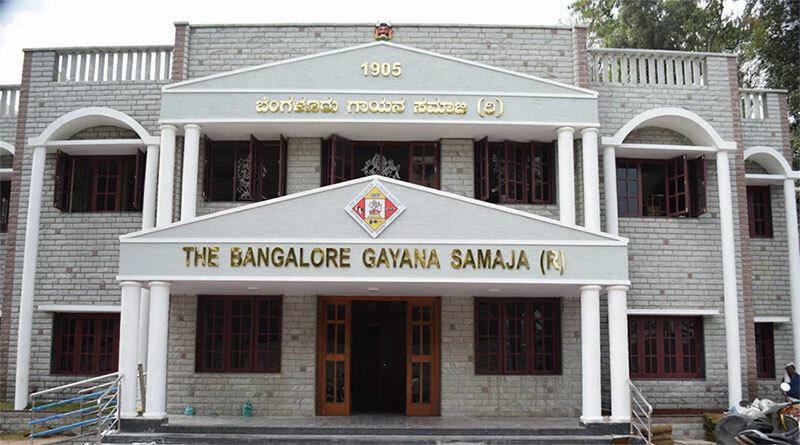 Bangalore Gayana Samaja managing committee members posing with the BHARATHI THYAGARAJA Sanman award conferred by Sringeri Sharada Peeta Swamiji on 12th July. 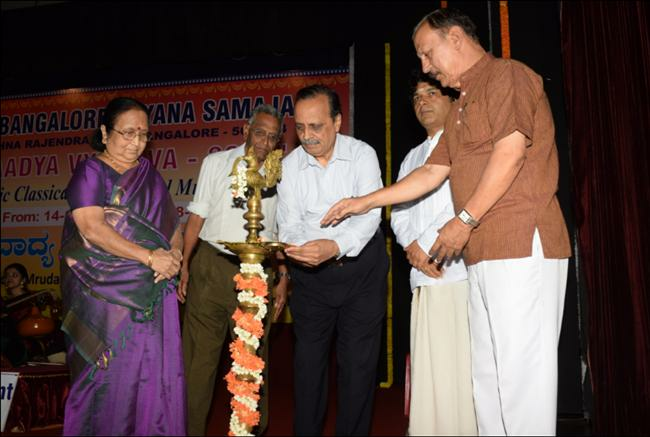 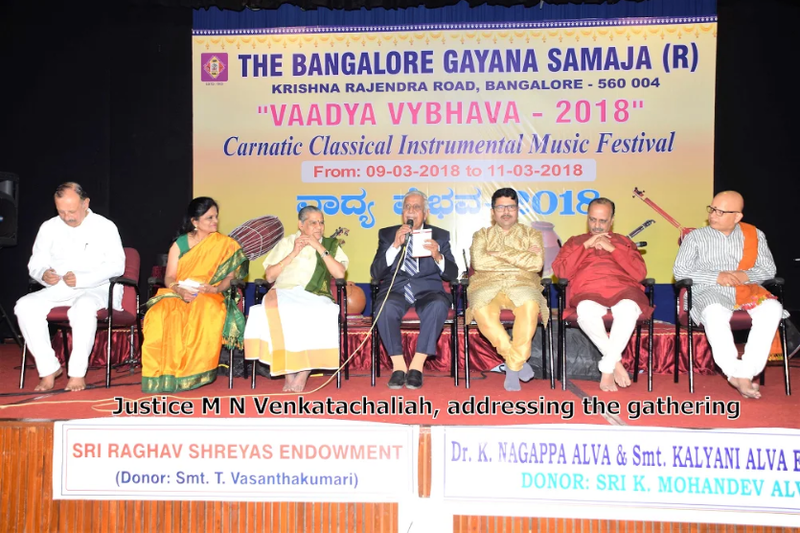 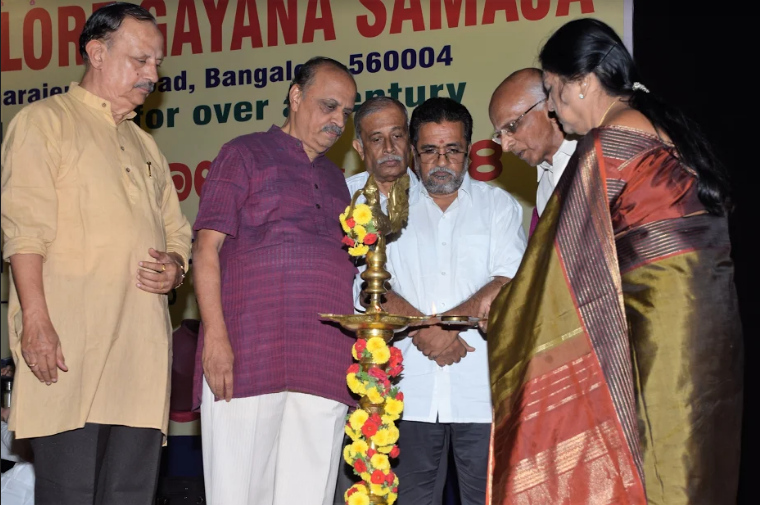 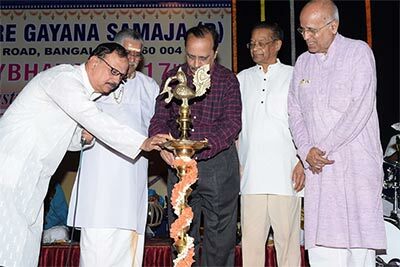 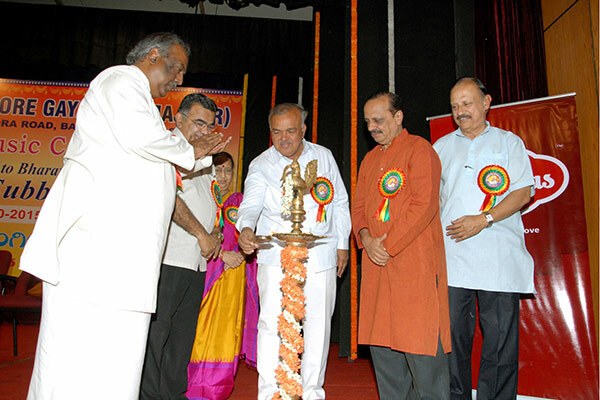 Inauguration of "Vaadya Vaibhava - 2015" on Friday the 14th August by the President Dr.M.R.V.Prasad, Vice President Smt.Kanaka Swamy, Secretary Achutha Rao Padaki and Vid.Kumaresh. 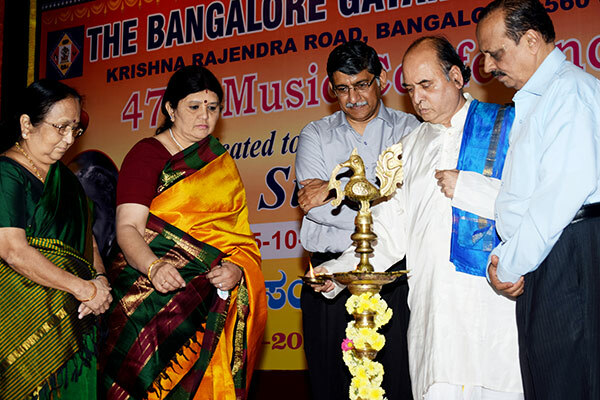 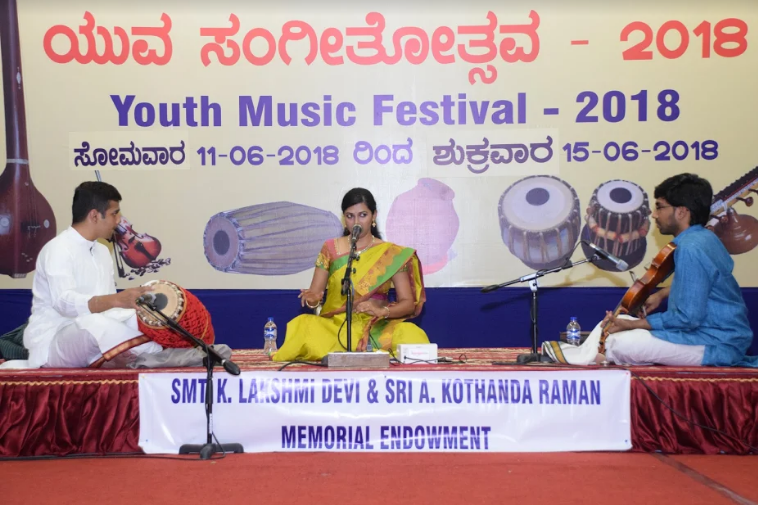 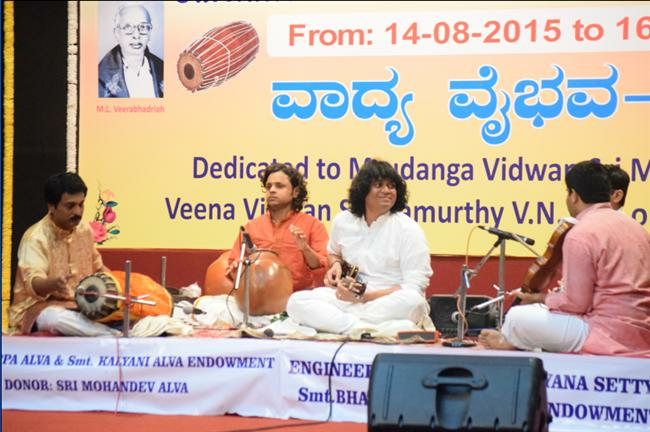 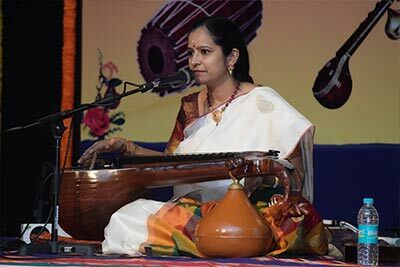 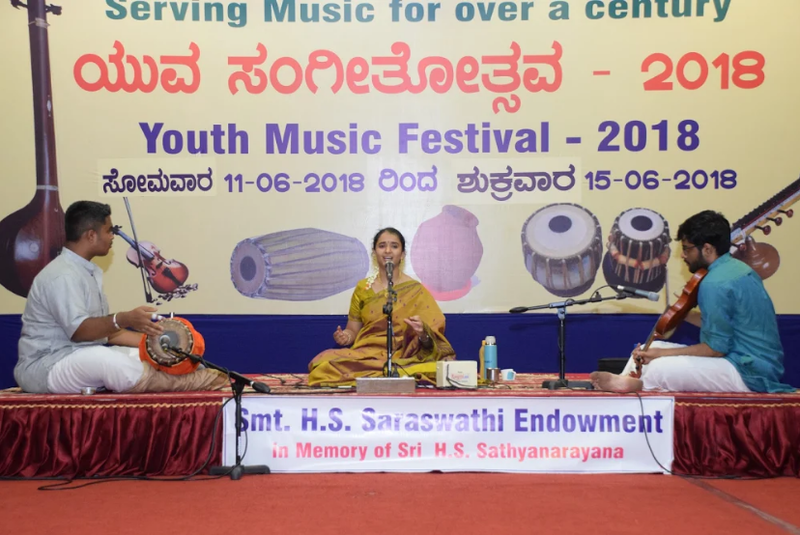 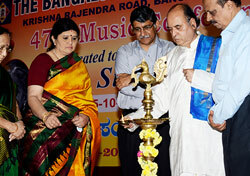 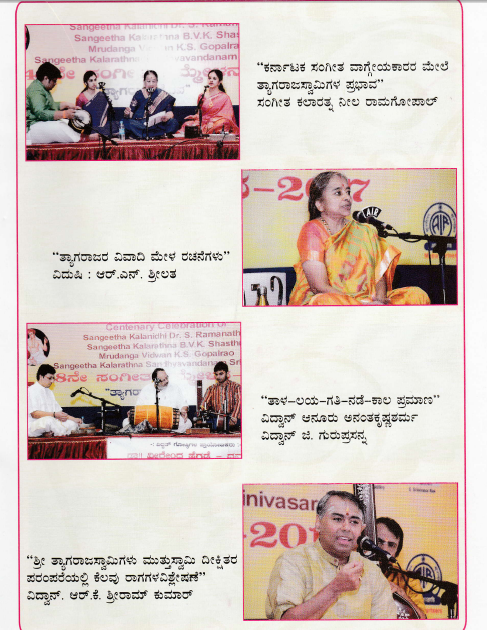 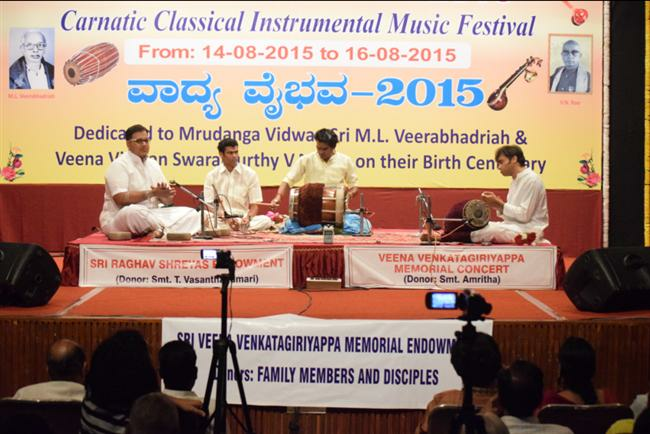 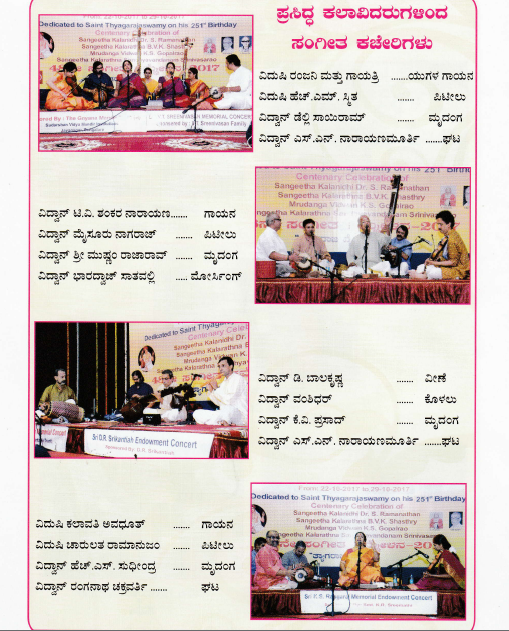 Veena concert on 14th August by Dr.Suma Sudhindra and party. 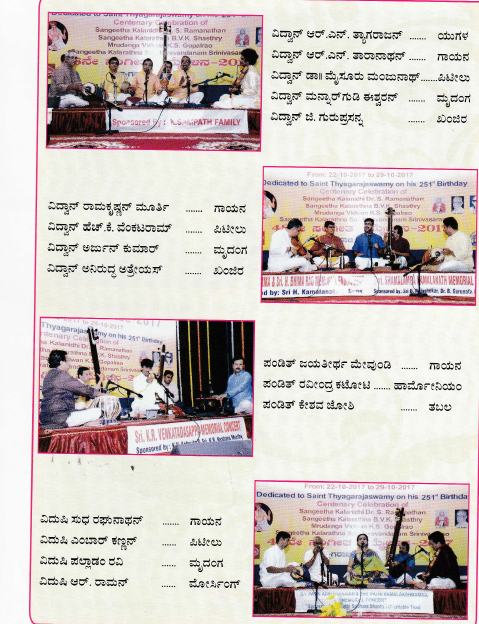 Mandolin concert by Vid.U.Rajesh and party on Saturday the 15th August. 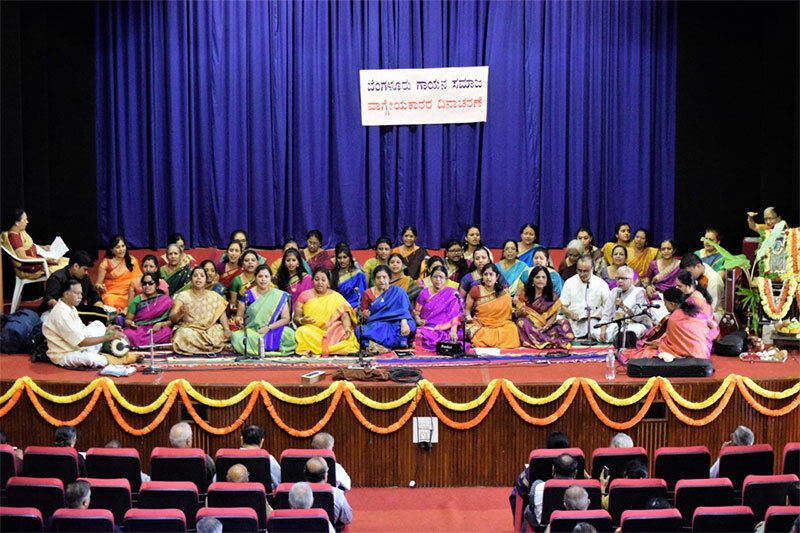 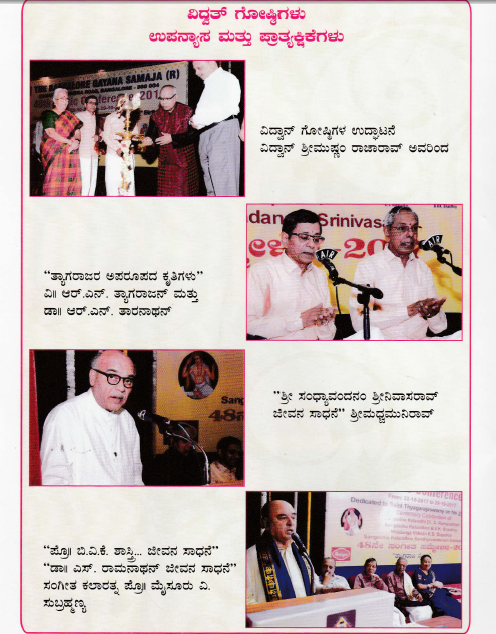 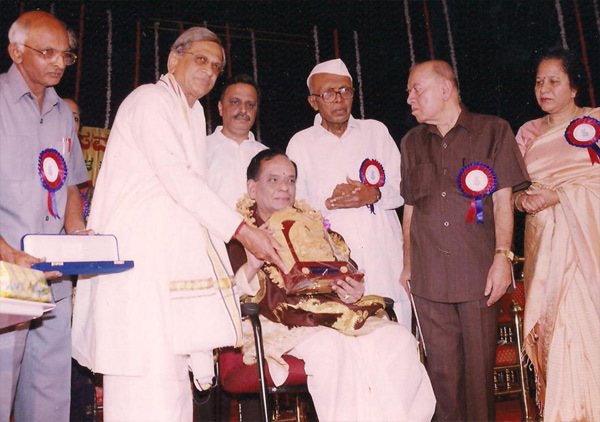 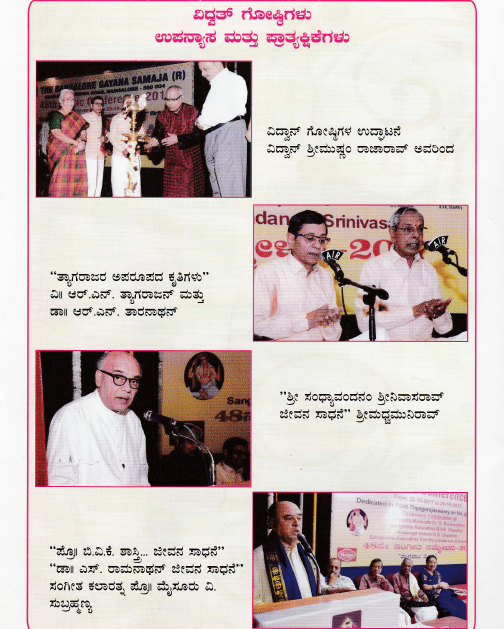 Honouring Mrudanga Maestro Dr.T.K.Murthy ji with the Title "NAADA SHRI" by Nadoja prof.G.Venkata Subbiah along with the President,Vice President, Secretary.Vid Kumaresh and other committee memberson Sunday the 16th August. 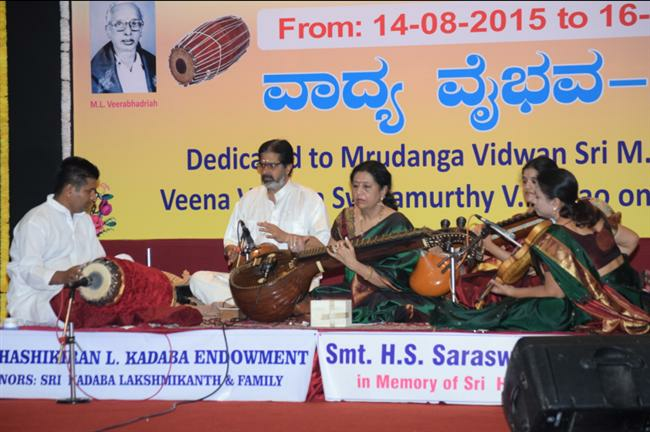 Laya Vinyasa - The instrumental ensemble by Vid.Mannargudi Vasu and party on 16th August. 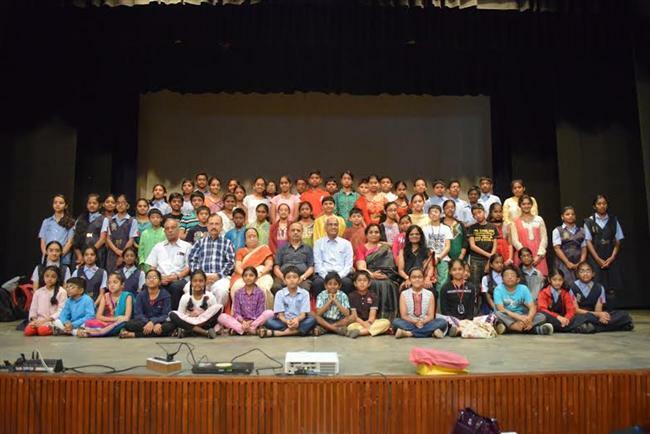 GROUP PHOTOGRAPH TAKEN WITH THE PARTICIPANTS OF "TAG RAAGA IDENTIFICATION COMPETETION HELD ON SUNDAY THE 23RD AUGUST IN ASSOCIATION WITH BANGALORE GAYANA SAMAJA. THE PRESIDENT DR.M.R.V.PRASAD, THE SECRETARY ACHUTHA RAO PADAKI, VICE PRESIDENT SMT.KANAKA SWAMY, SRI.R.T.CHARI OF TAG ASSOCIATES AND COMMITTEE MEMBERS K.NAGARAJ.MALLIKA NARAYAN AND DR.K.V.GAYATHRI ARE IN THE PICTURE. 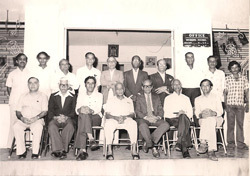 GROUP PHOTOGRAPH WITH ALL THE COMMITTEE MEMBERS. 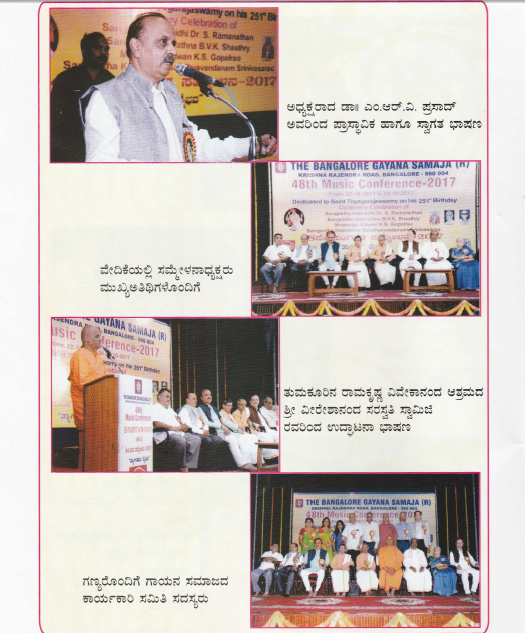 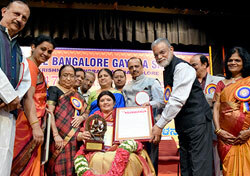 B.S.CHANDRAKALA "SWARALIPI" AWARD FUNCTION HELD ON SUNDAY THE 31ST OF JANUARY, HONORING DR.G.V.JAYA RAJASHEKAR WITH THE TITLE "LIPI PRAAGNE" BY DR.MANU BALIGAR .PROF MYSORE.V.SUBRAMANYA,THE PRESIDENT,SECRETARY AND THE VICE PRESIDENT ALONG WITH SOME OFFICE BEARERS ARE IN THE PICTURE. 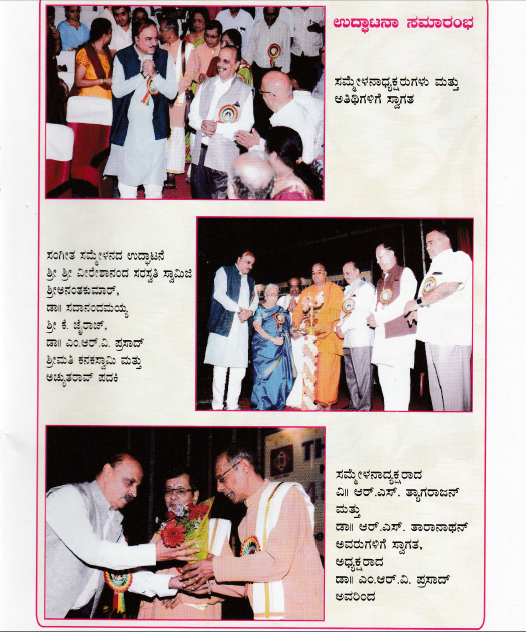 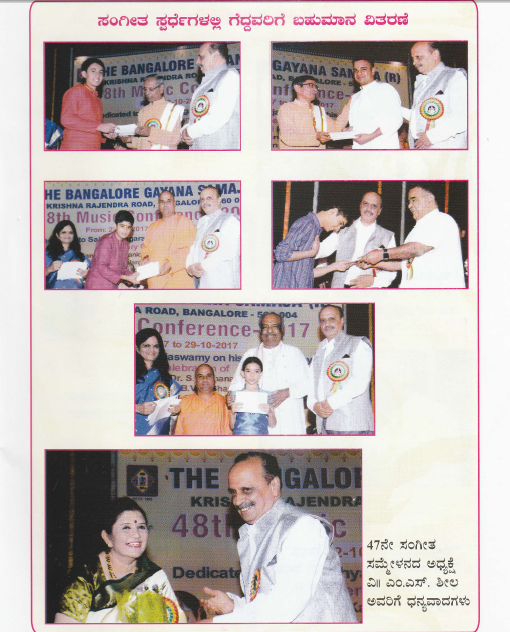 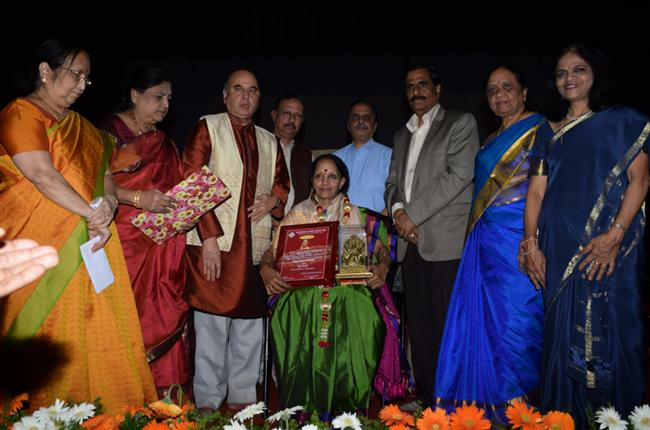 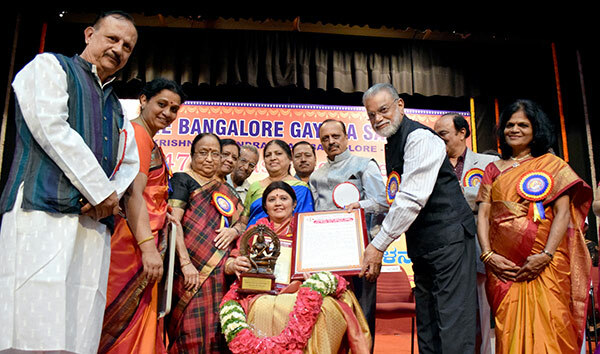 HONOURING VID GEETHA RAMANAND WITHE THE TITLE "SWARABHUSHINI" BY PRO.MYSORE.V.SUBRAMANYA AND DR.MANU BALIGAR.ALONG WITH THE PRESIDENT, SECRETARY.VICE PRESIDENT AND OTHER OFFICE BEARERS. 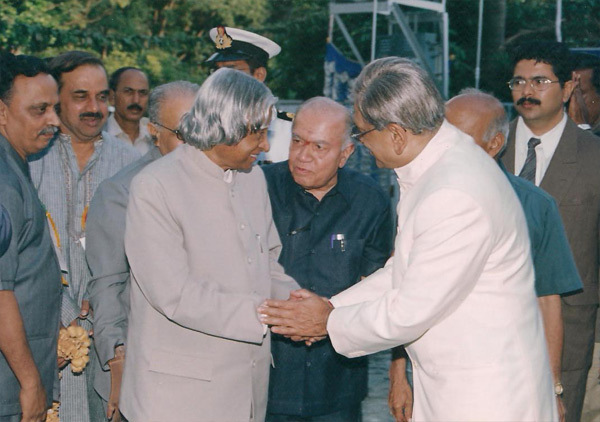 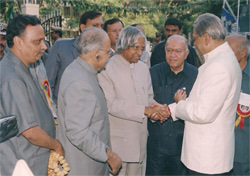 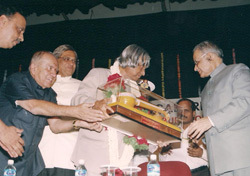 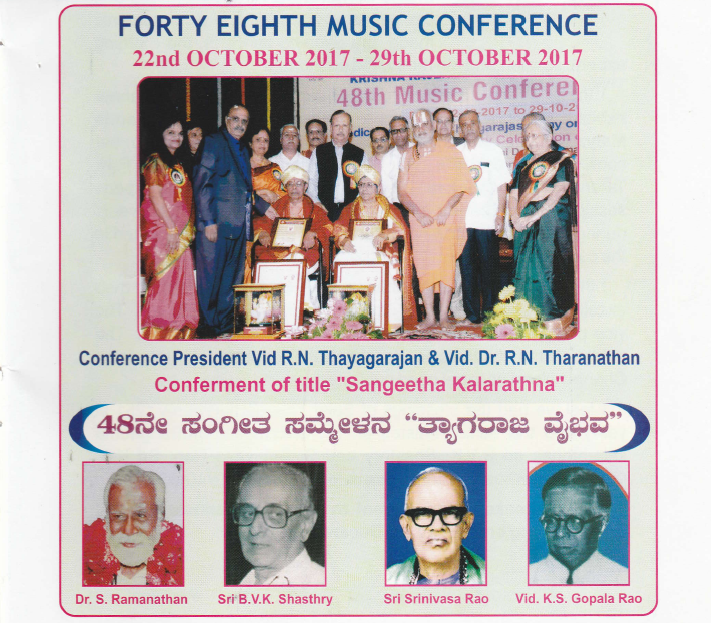 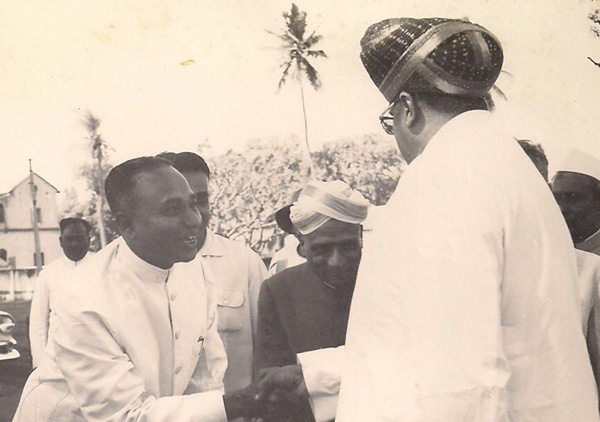 By Sri.Achutha Rao Padaki,Vid.B.K.Chandra Mouli,Dr.M.R.V.Prasad,Sri.Pathi Sridhar And Sri Mohan Dev Alva. 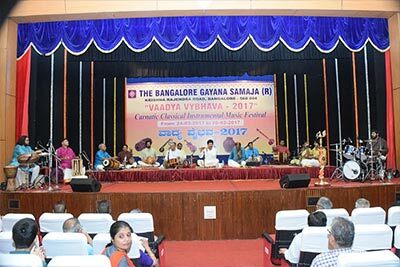 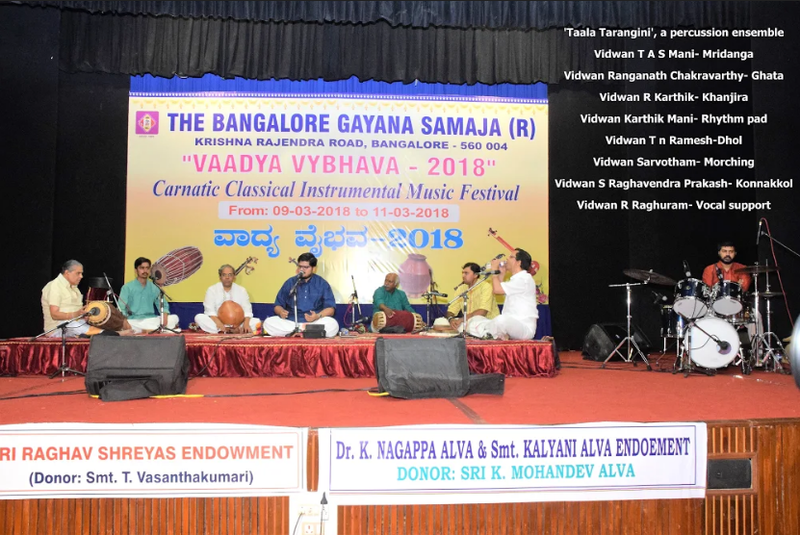 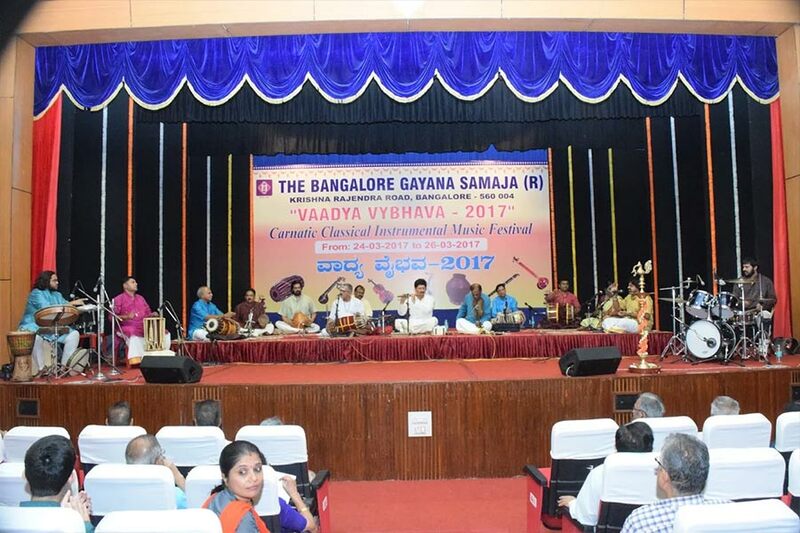 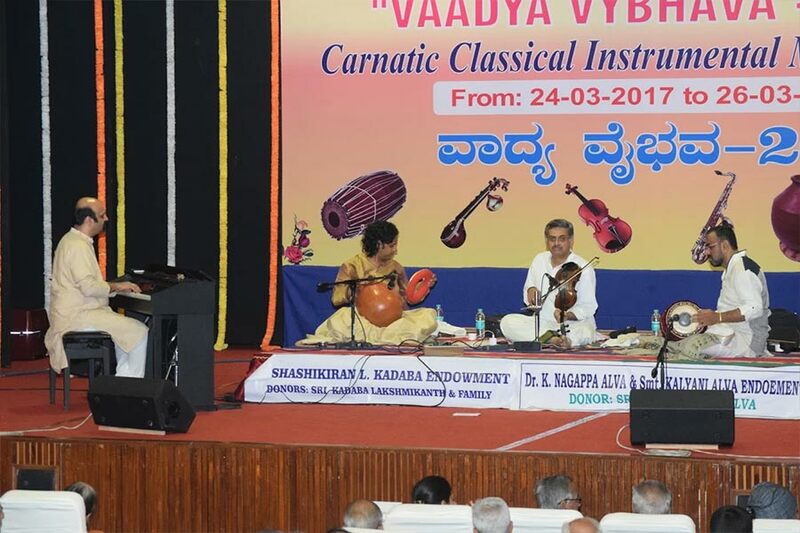 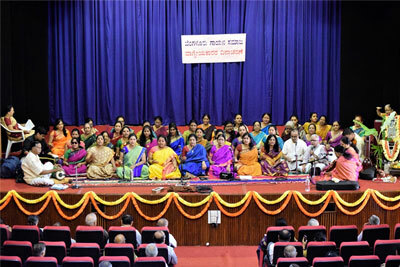 Percussion Ensemble "Laya Milana" Presents "Sunada Vaadya Vaibhava" Dierected And Lead By Dr.B.K.Chandra Mouli And Team Consisting Of 12 Instruments And 14 Players, On 24.03.2017 Evening. 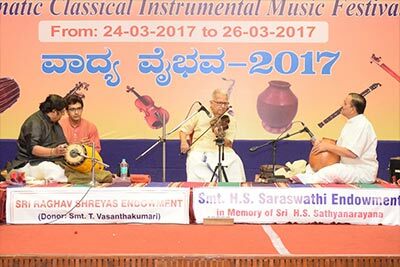 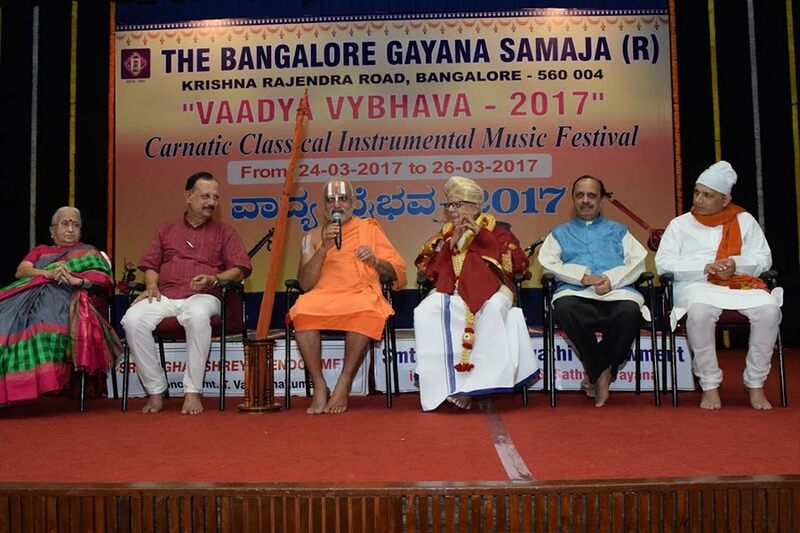 Instrumental Jugalbandhi On The Second Day 25th March 2017 Evening By Vid.H.K.Venkataram (Violin), Vid.Anil Srinivasan(Piano),Vid.K.U.Jayachandra Rao ()Mridanga) And Vid.Giridhar Udupa On Ghata. 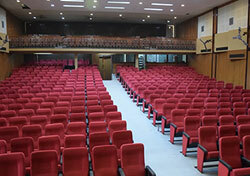 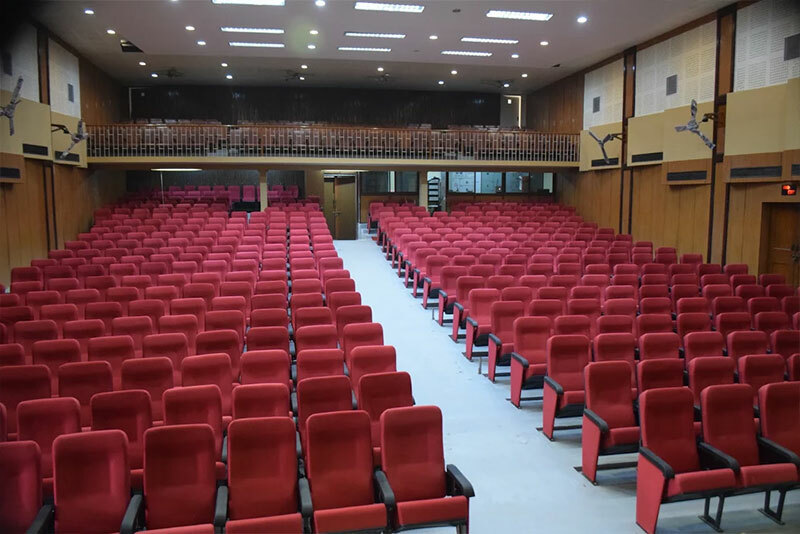 Morning Session Lecture Demonstration :" Veena Venkatagiriyppa Memorial Day" On 26th March 2017 From 10 Am T0 1pm. 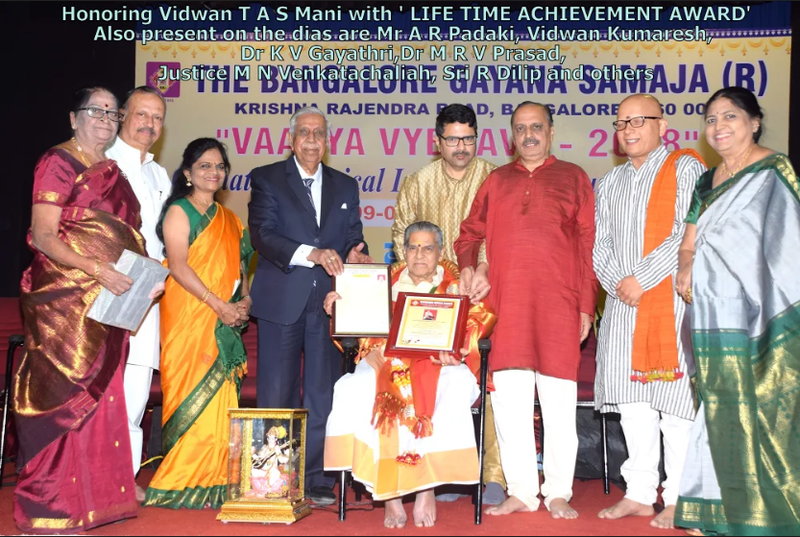 First Session By Vid.Jayanthi Kumaresh, Dsc 0103 Jpg: Second Session By Vid.D.Balakrishna And Dsc 0107 Jpg "The Third Session By Vid.Pramath Kiran. .
"Naada Sri" Award Presented To Padmabhushana Prof.T.N.Krishnan For His Life Time Achievement. 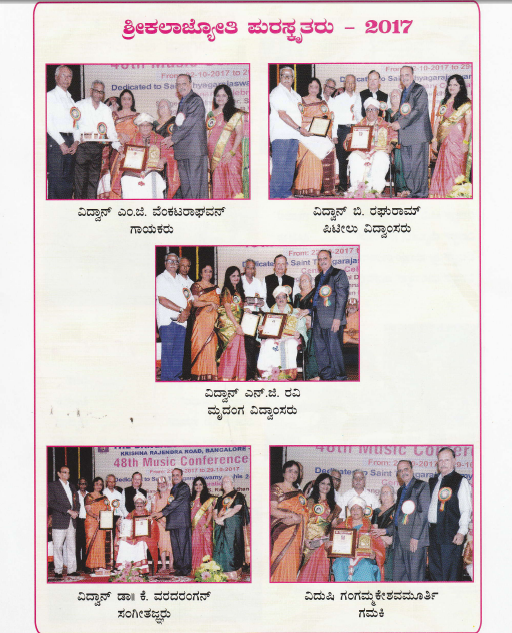 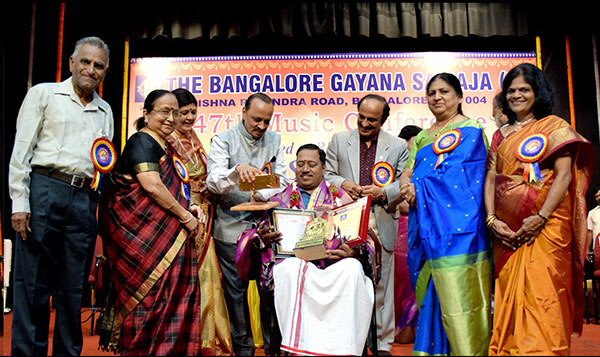 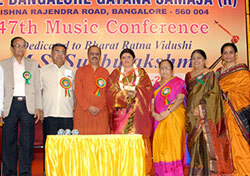 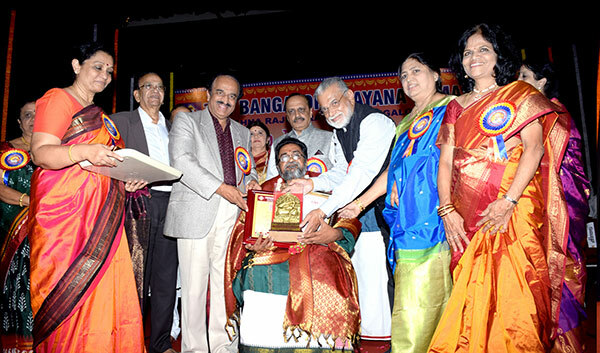 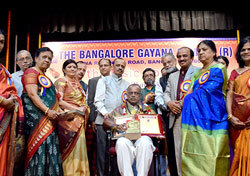 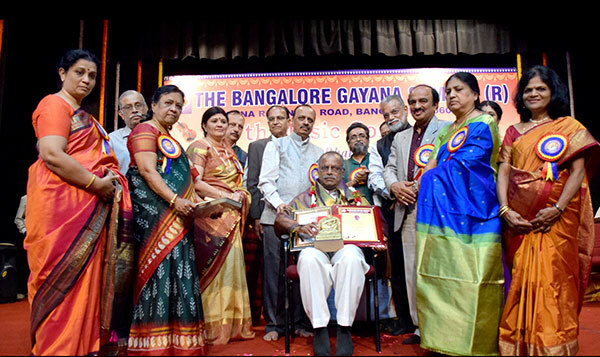 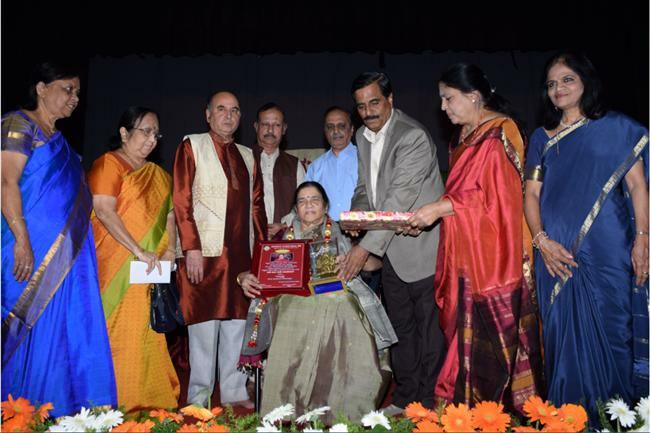 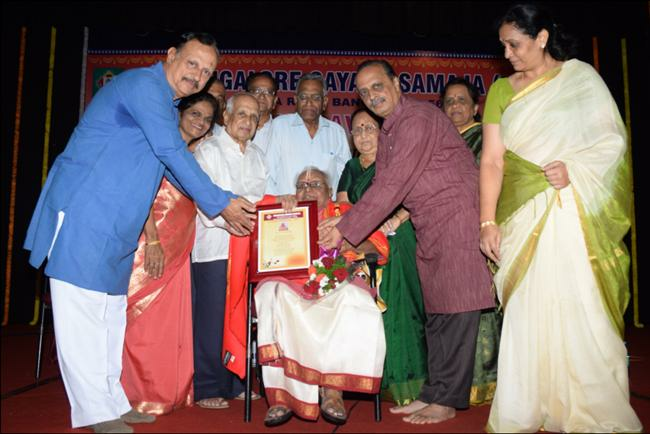 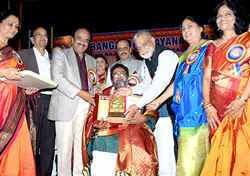 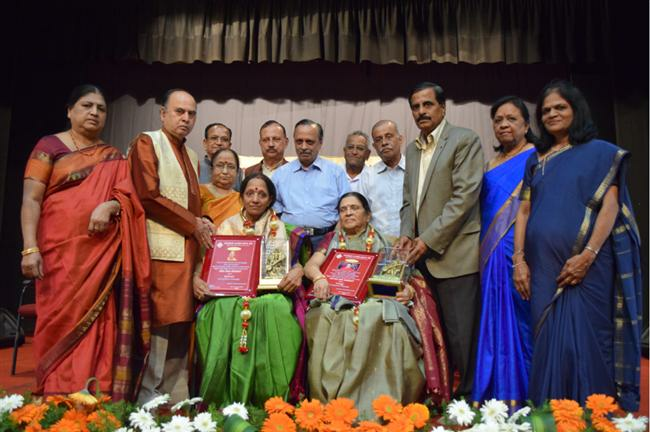 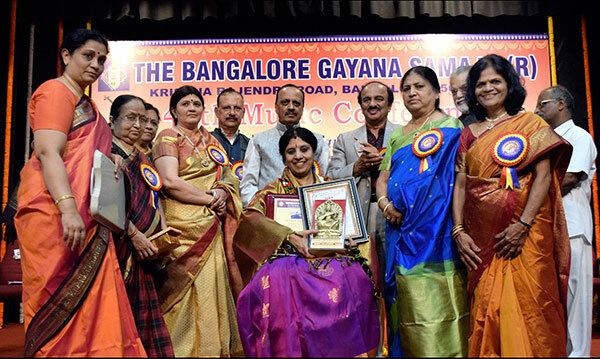 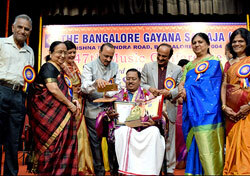 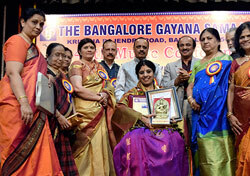 Left To Right Along With The Awardee Are Smt.Kanaka Swamy,Dr.K.V.Gayathri, Sri Sri Yadugiri Yathiraja Narayana Jeeyar.Smt.Nagamani Ramakrishna,Sri.Achutha Rao Padaki,Vid.Kumaresh And Dr.M.R.V.Prasad. 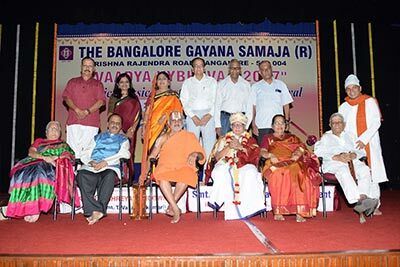 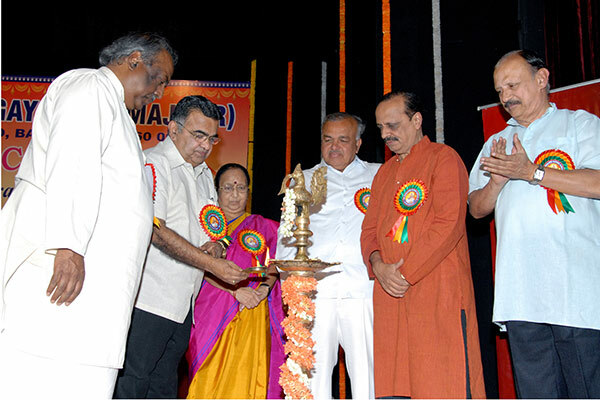 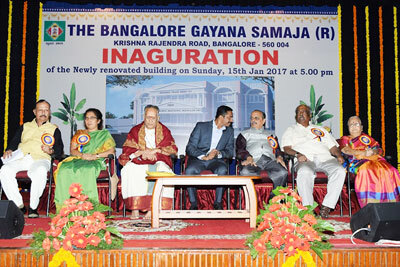 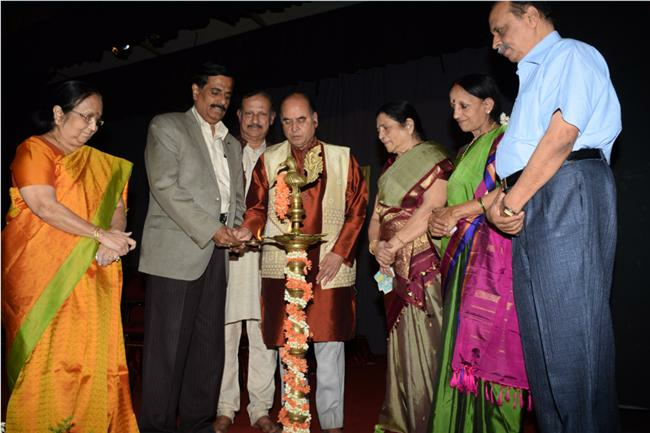 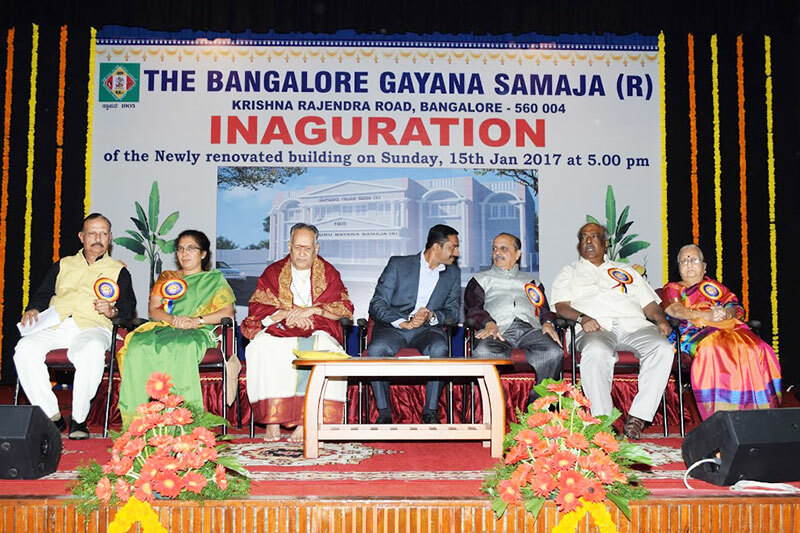 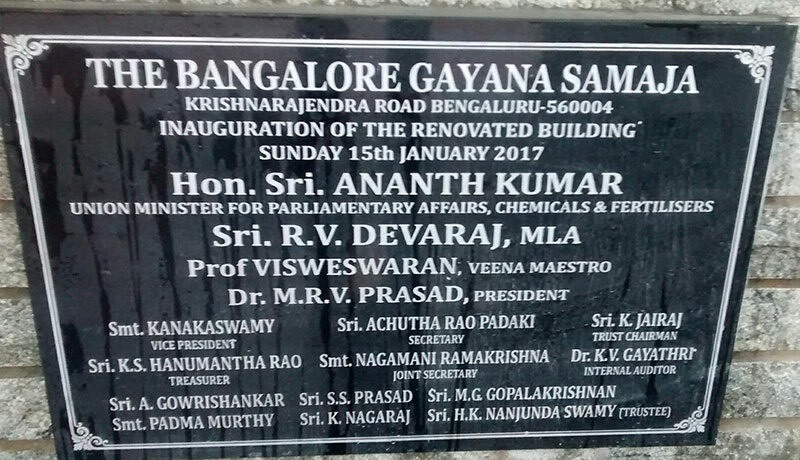 On Stage From Left To Right Are Smt.Kanaka Swamy(Vice President),Sri.Achutha Rao Padaki (Hon.Secretary),Sri Sri Yadugiri Yathiraja Matha Narayana Jeeyar (Chief Guest),Prof.T.N.Krishnan (Awardee),Dr.M.R.V.Prasad(President) And Vid.Kumaresh. 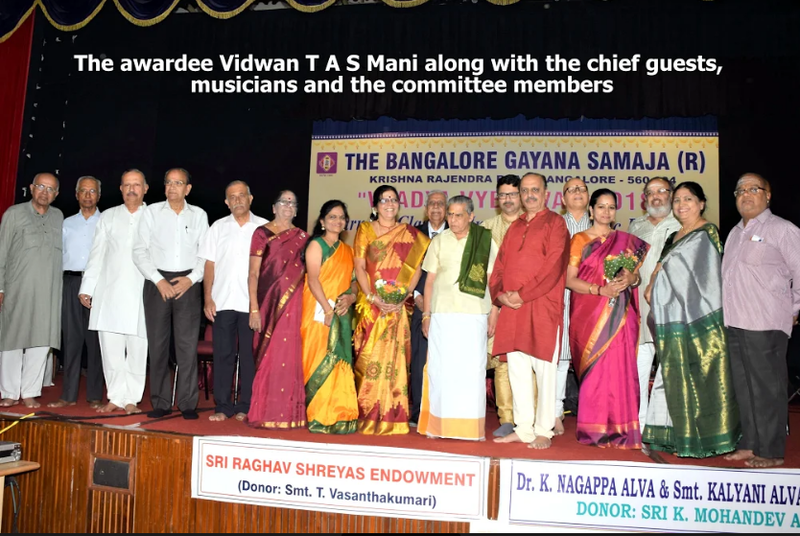 All The Managing Committee Members With The Chif Guest And Awardee Are Sitting Left To Right Vid.Kanaka Swamy,Dr.M.R.V.Prasad, Srisri Yadugiri Yathiraja Narayana Jeeyar, Naada Shri Prof.T.N.Krishnan. 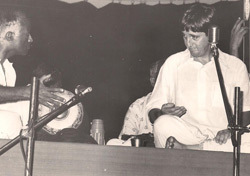 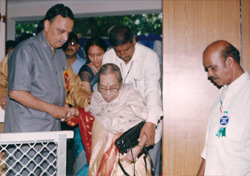 Mrs.Kamala Krishnan.Vid.Rajagopalan And Vid.Kumaresh. 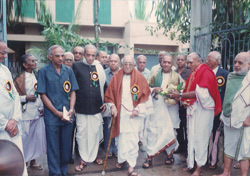 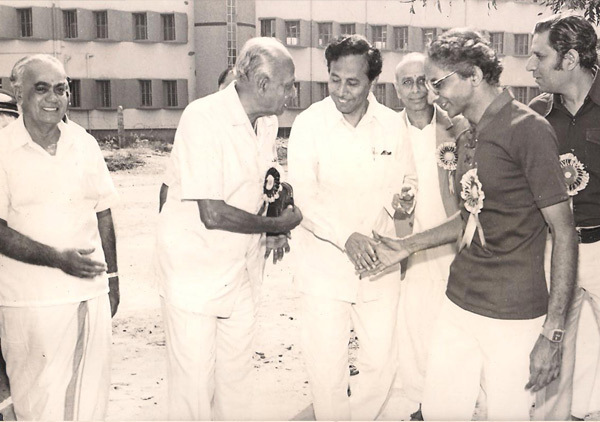 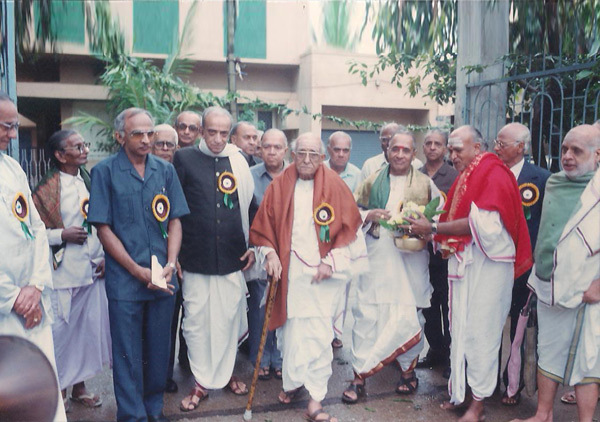 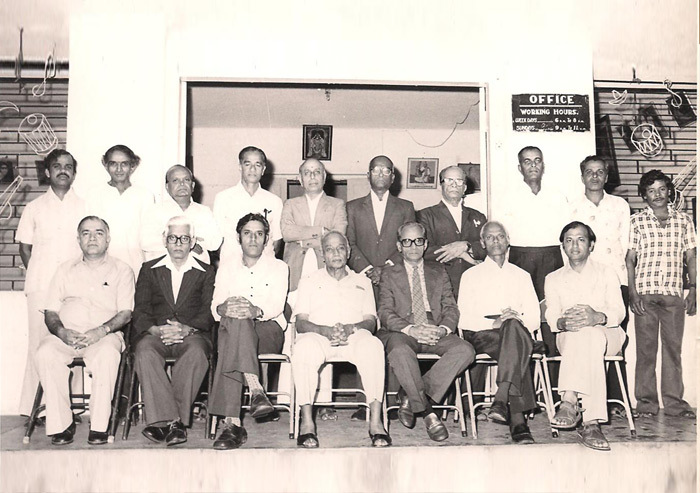 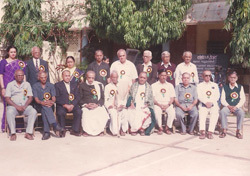 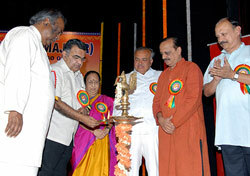 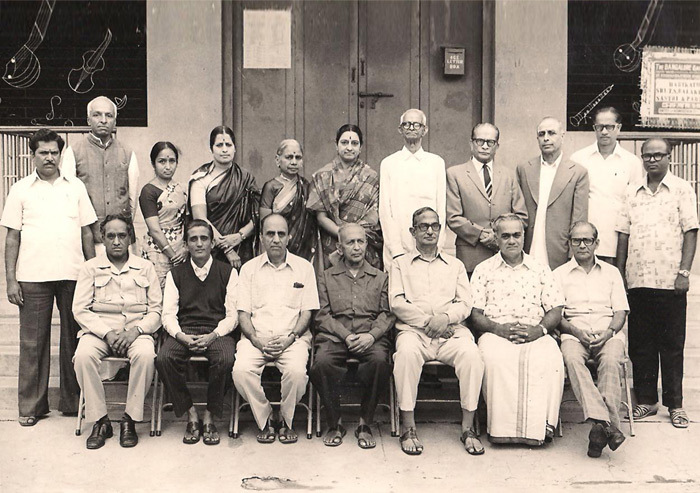 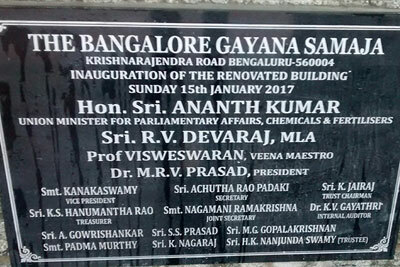 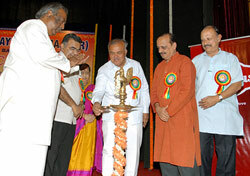 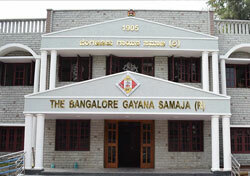 Standing From Left Tiright Are Sri.Achutha Rao Padaki,Dr.K.V.Gayathri, Smt.Nagamani Ramakrishna,Sri.K.S.Hanumantha Rao.Sri.S.S.Prasad And Sri.K.Nagaraj. 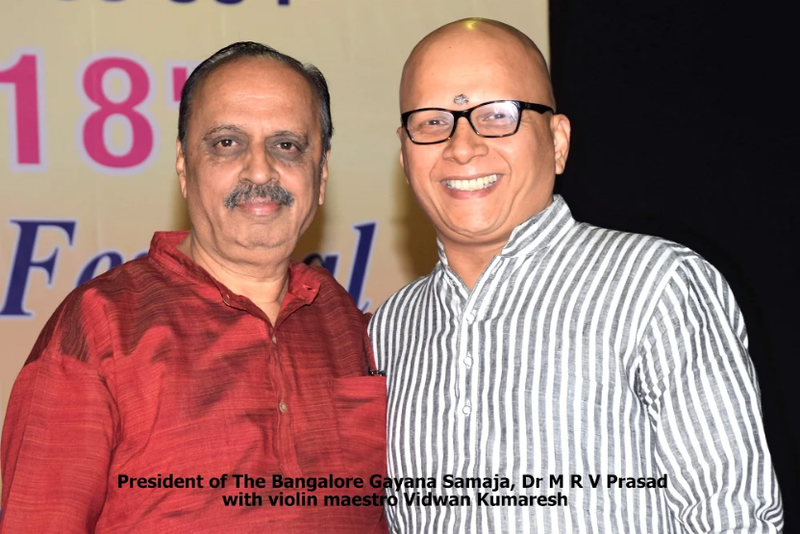 Naada Shri Prof T.N.Krishnan's Solo Violin Concert After The Award Function In The Evening With Vid.Thiruvavur Bhaktha Vathsalam On Mrudanga And Vid.Vaikom Gopalakrishnan On Ghata. 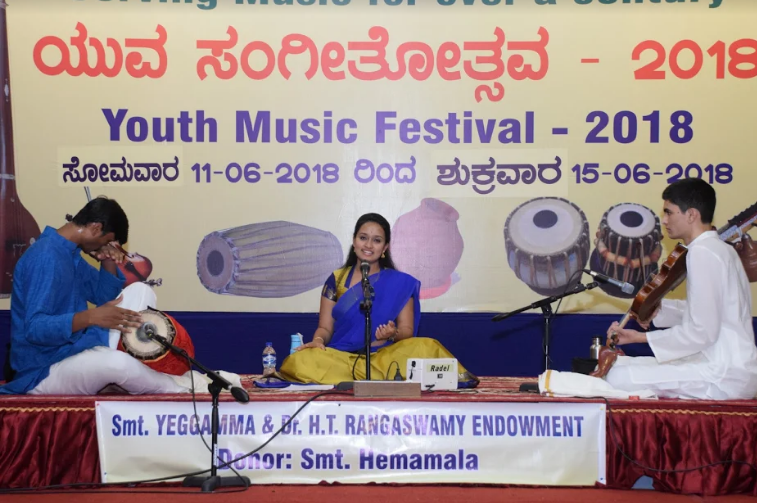 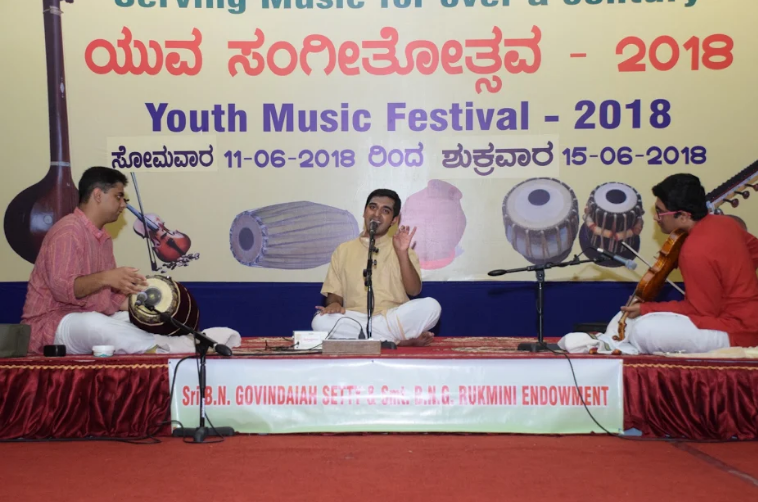 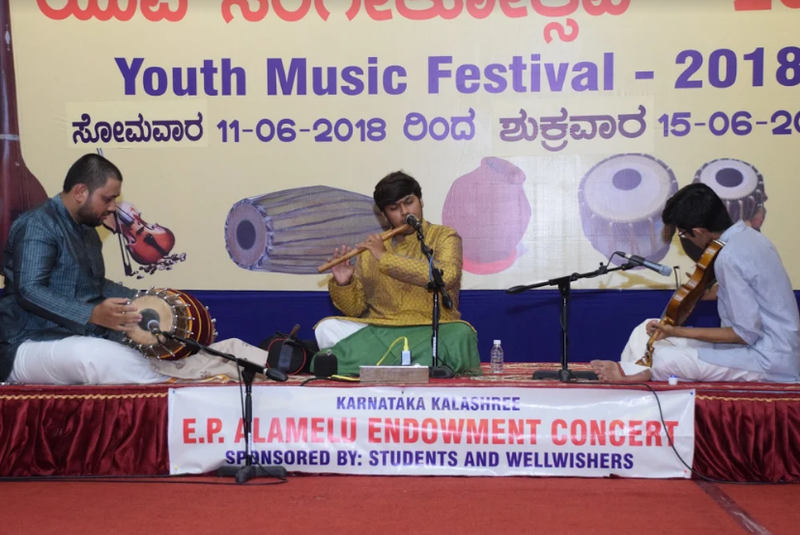 Carnatic classical vocal by Vidushi Madhuri Kowshik, violin by Vid.S.Janardhan and Mrudanga by Vid.Rakshith Sharma on 15.06.2018.